I saw a greeting card like this somewhere on line but I didn't write down the name and I am so sorry if it was your idea. 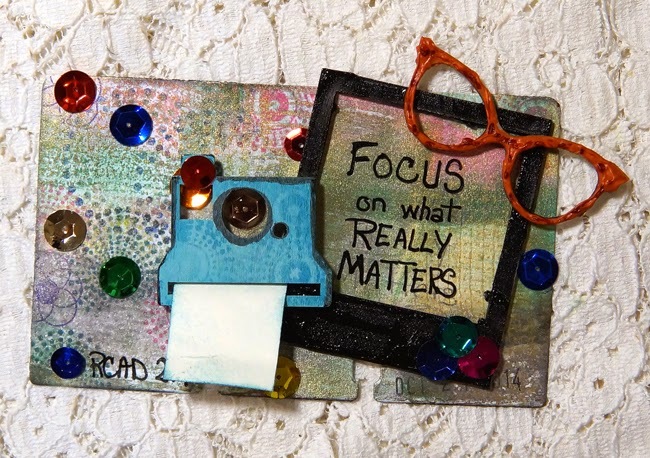 I do love the quote, Focus on what really matters," and I had the glasses the camera and frame. I was excited to have a way to use them. Thanks for stopping by and I hope your day is filled with focus on kindness to your self and others. Loveeeeeee the sequins and the glasses!!!! Such a fun design and I love the addition of the altered glasses. Sounds like you are happy to be back in your craft room.